Antique-style Edison bulbs are a subtle update people use in their home or business to help make their fixtures pop. Few people look up while having dinner at their favorite restaurant or watering hole. But, if you were to, there's a chance you may notice these antique bulbs helping to set the mood. They provide a vintage look and are often used with a modern fixture to balance its appearance in a room. Their amber glow instantly changes whatever room they're placed in. When the Energy and Independence Security Act (EISA) was signed many thought that these light bulbs would no longer be available. The act, which prevented the manufacturing of incandescent light bulbs from 100W down to 40W, led many to wonder if the government was fit to legislate what light bulbs people can buy but it included many exclusions. One such exclusion was for specialty light bulbs, which antique light bulbs are bucketed under. 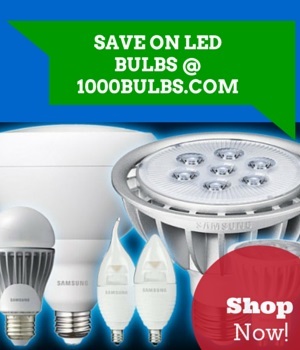 Most of the LED light bulbs available for purchase today focus on the most popular household bulbs such as A-shape and reflectors. As prices have come down, more and more people have chosen to upgrade from incandescent to LED but there wasn't a suitable replacement for antique Edison bulbs unless you're willing to pay $30 a bulb and wait for your bulbs to get to you from Australia. That's no longer the case in the US with the launch of LED Edison bulbs by LifeBulb. Incandescent antique bulbs sell for well over $10 at some stores, but LED alternatives are available from $9.99. At $13.99, the LifeBulb LVTSED1930022K1 LED filament bulb uses just 4.5 Watts making it a great way to add a flare of design while lowering your electric bill. Its 2200K color temperature produces a warm white glow which is tinted further with the amber colored coating on the glass. With a life rating of 15,000 hours, you'd end up using 5 incandescent antique bulbs to match this LED. Some people are still leery when it comes to making the switch but a 3 year limited warranty should fix that. Does this light bulb sound like something you'd use? Let us know below in the comments or on Facebook, Twitter, Google Plus, LinkedIn, Pinterest, or Instagram!